Participatory Budgeting Is Music To Medellin's Poor The Colombian city is one of the largest in the world to practice participatory budgeting — which has helped bring arts and social services to streets otherwise torn by poverty and violence. Members of the Colombian music group Son Bata, including founder Jhon Jaime Sanches (bottom right). Colombia's image is still tainted by its long and violent drug war, but its second largest city is practicing one of the most innovative forms of city democracy anywhere. Medellin is one of few big cities in the world to have successfully implemented a participatory budgeting system: Citizens define priorities, and public money is allocated accordingly. Jhon Jaime Sanches, 26, grew up in the hills of Medellin, under the legacy of Pablo Escobar's violent drug cartel. "Militias would come to our school and tell us we had to take up arms to make revolution," Sanches says. "I liked the idea that we needed to find a solution to change things — but what I didn't believe is that we needed to do it with violence." So Sanches found another way: He started a band. But his hip-hop group Son Bata is more than that — over the years it has grown into a social service force against the crushing poverty of his neighborhood. Son Bata's base of operations is a colorful cultural center. It stands out from the background in Medellin, where ramshackle homes pile on top of each other, and open sewers pour down nearly vertical streets. Within its walls, hundreds of children find an escape through free music classes, and working musicians from the slums get help finding performing jobs. "For me, it's everything," says Ingris Joanna Jaramillo, who works at the center. "Son Bata is my life. When I started being part of Son Bata is when I started to dream." Part of what has helped the group is Medellin's process of participatory budgeting, which divides the city into small neighborhoods. Residents allocate part of the city budget to health centers, college scholarships and youth music groups that have sprung up in Medellin. Sanches gets 30 percent of his operating budget through the system. "With participatory budgeting, Son Bata has contracted with professors," Sanches says. "We bought instruments. We are creating a music studio." Participatory budgeting originated in Porto Alegre, Brazil, in 1989. It's 5 percent of the city budget in Medellin, one of the largest cities in the world to have successfully adopted it. Sanches says it's not enough to make deep structural changes — but by most measures, the system has been a success. Alberto Diaz-Cayeros of the University of California, San Diego, has been studying the ways such systems take root in Mexico. He says there is not a lot of research about it, but he knows that historical factors have to be just right, like they were in Medellin. "This happened in [a violent city], in a deep crisis, where a mayor came in without any connections to established political parties, with a new vision of how to run local government," Diaz-Cayeros says. That mayor, Sergio Fajardo, is now running for governor of the Colombian state of Antioquia, home to Medellin. He worries that another challenge remains: keeping citizens engaged. "In the communities, people may get tired," he says. "You have to make sure you mix things up, that you keep the flame alive." For Son Bata's Sanches, at least, the flame shows little sign of fading. "Participatory budgeting is a very valuable way for the youth to understand how, with a resource, I can try to solve the problems of my community," he says. This budgeting process didn't create Sanches' group — Son Bata existed a year before it even came into effect. 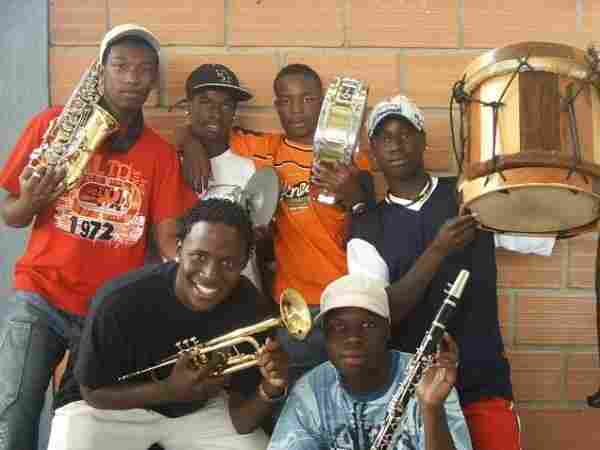 But it did make city money easier to get, for him and dozens of youth music groups in Medellin. Energetic idealists, in any city, may be unlikely to pass up that kind of opportunity.